preserves | Apple pie, anyone? Hi. The old recipe swap posts are popping up in some of your readers because I added the tag ‘swap’ to them. Dumb. Sorry for the confusion! 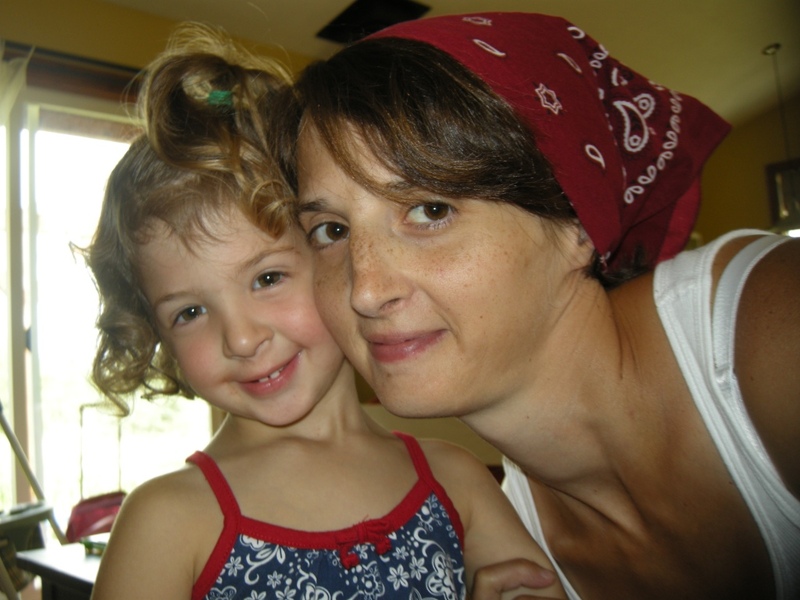 My name is Katie and I wear bandanas when I’m working in the kitchen. Jim mentioned something the other day and I cannot get it out of my head… so, we’re going with it: A canning/preserves/pantry staples collection cookbook. Right now, cooks all over the country are digging out all their scraps of paper, last year’s harvest notes, and every canning lid they can find. It’s the perfect time to gather it all together in one little book. Here’s what I was thinking: to assist me (selfish, I know… but you’ll get something out of it, too) in my Pantry Swap Project as well as help organize my kitchen recipes, I’d love for you to collect a minimum of 3 family recipes. These 3 recipes must be for items that are to be canned or frozen or homemade. Think breads, stews, soups, spaghetti sauce, ketchup, salsa, salad dressing mixes, pickles, jam, marinades, dry brownie mix, tried and true home cleaning concoctions (?) etc. etc. aaaaaand etc. Think things that you COULD buy at the grocery store but MAKE AT HOME instead. Think things that look good in a jar. We’ll do cookies/desserts and casseroles later this winter, so save those. SAVE. THOSE. Think your Gramma’s perfect sandwich bread. Your favorite garlic pickles. Your cousin’s homemade russian dressing. Perhaps YOU are not a canner, but your mother IS. Wouldn’t this be a sweet little project to include your Great Aunt in? Take her out to lunch and ask her who had the best [fill in the blank]? Talk about old times and new times and good food. Each of your 3 recipes must be different: only ONE bread or one salsa or one pickle, etc. If you send in MORE than 3 recipes, then you may repeat main ingredients. No recipes, please, that you simply plug into allrecipes.com. Unless, that IS the recipe you’ve used for the past 5 years. We’re looking for Old Time Religion, here. Since this is likely to be a smaller group (although, y’all have shocked me more times than I’ve lost power out here in the boonies), I thought maybe we’d up the ante a bit as well. Three recipe contributions gets you a copy of the pamphlet (or novel) of Old Time Goodness AND a partner to trade an apron with. Mmmmm hmmmm. Canning is messy work, and we be needing some coveralls to make tomato sauce. You can find plain aprons for $3.50 in the super market kitchen aisle. You can make one. You can find a vintage one at a garage sale. You can buy one off etsy. It can be a half apron, a full apron, or anything in-between. It just cannot say ‘Kiss the Cook.’ Lord knows the world does not need any more Kiss the Cook aprons floating around. • Please only sign up if you are willing to play all the way through- as in, email your recipes AND your apron in a timely manner. So, think about it. I’ll have the recipe template ready by the end of the week. If you’re IN, start collecting your recipes. 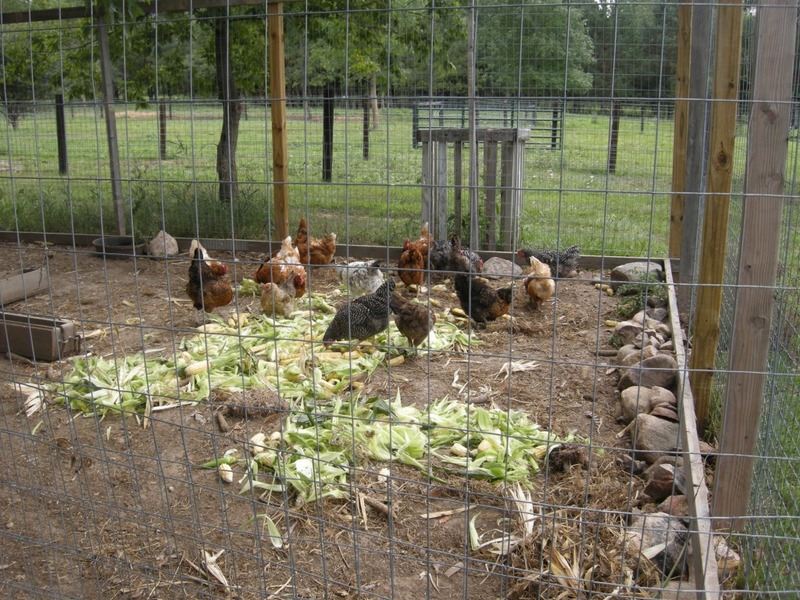 I’ll email you the template and we’ll get to creatin’ some Homesteading Goodness. I honestly do not know what to do with this kid. 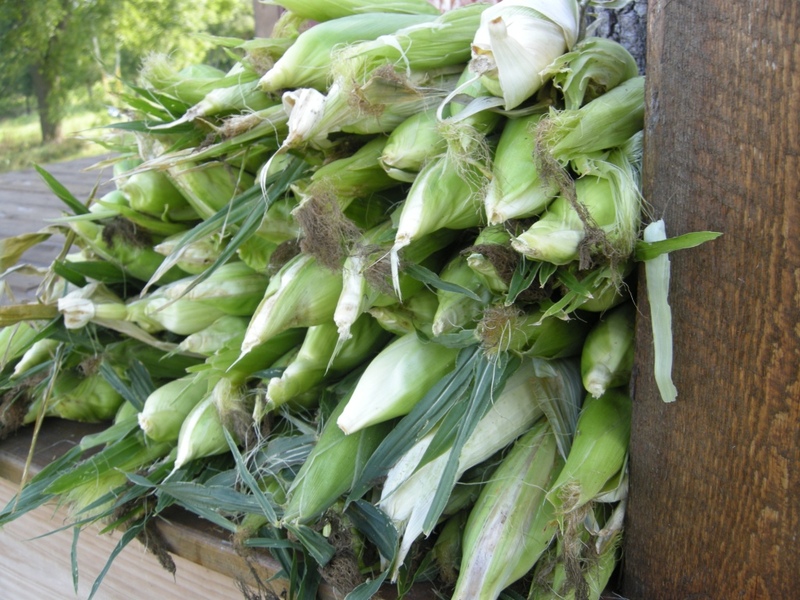 Our abbreviated garden is finished with its sweet corn crop for the year. This family loves corn. I do not like frozen corn, though. Too mushy? I dunno… something about it. This year I’m freezing it in glass jars and see if that changes the texture (as opposed to being in plastic baggies). If it’s no good, then next year I’ll do the full-on liquid canning. The smaller jars work great for our individual meals and are easier for me to measure in recipes and schtuff… so glass it is. 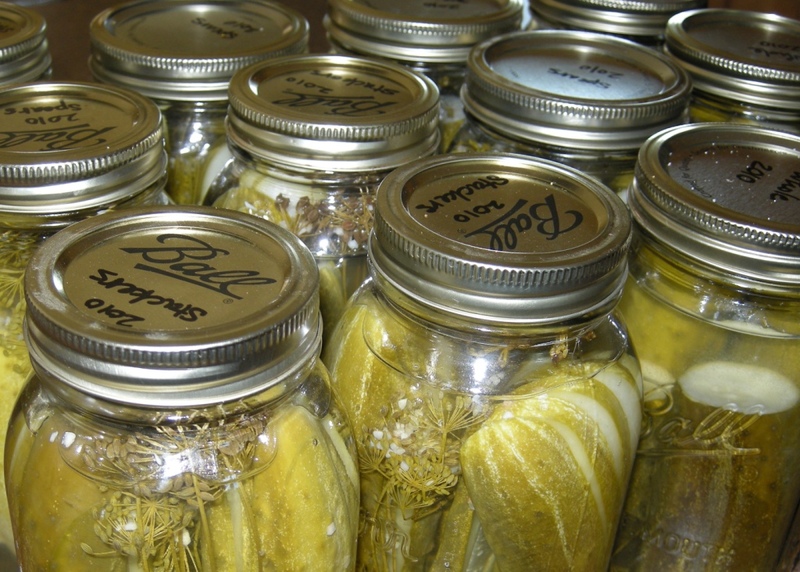 Preserving food is really, really easy, Folks. The issue is TIME. It takes a little commitment. None of this farming stuff is hard. But it does take time, effort, and repetition that we are simply unaccustomed to these days. Why spend 2 hours shucking corn for 10 measly jars when I can buy a can for 72 cents? It’s certainly not time-efficient. If you look at it from that standpoint, canning and preserving is absolutely not worth it. What used to be necessity and good planning is now a test in patience and frugality. You can buy anything you want at any time of the year… there is simply no need to can or preserve anymore. Our culture has traded more time for a loss in personal effort into your own food, personal input into your own food, and company. Canning (and quilting and harvesting and branding and planting… and all that ol’ time stuff, really) was a time when people worked together. The chore falls quickly to the background as conversation starts and stories are told and laughter or debates begin. Now that we are so efficient with our time, we sit in front of computers to make up for the lost company. It’s a strange trade-off. But, we are all victims of progress in one way or another. Here’s the simple process: gather, clean, cook, and pack. Curt and Rylie pick all the corn and throw it in a wheelbarrow. The next morning, Ry and I shuck and clean all the ears. Now, remember our garden is a wasteland this year… no fertilizer, no weeding, no nothin’. 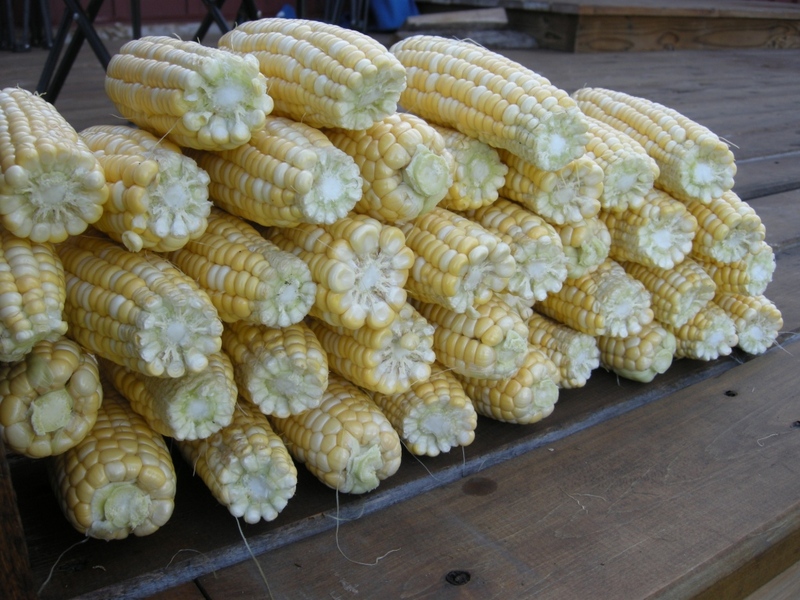 Not every ear of corn was worth canning, but that’s ok. Not every good ear was trimmed of every single kernel, either. 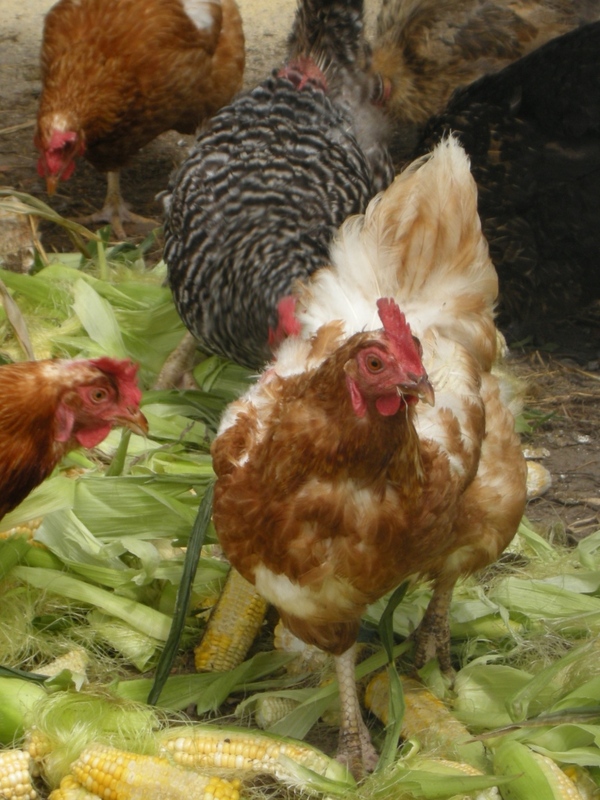 Our chickens were happy to handle the leftovers. I started a big pot of water and waited for it to boil. I added salt and butter… just a little. 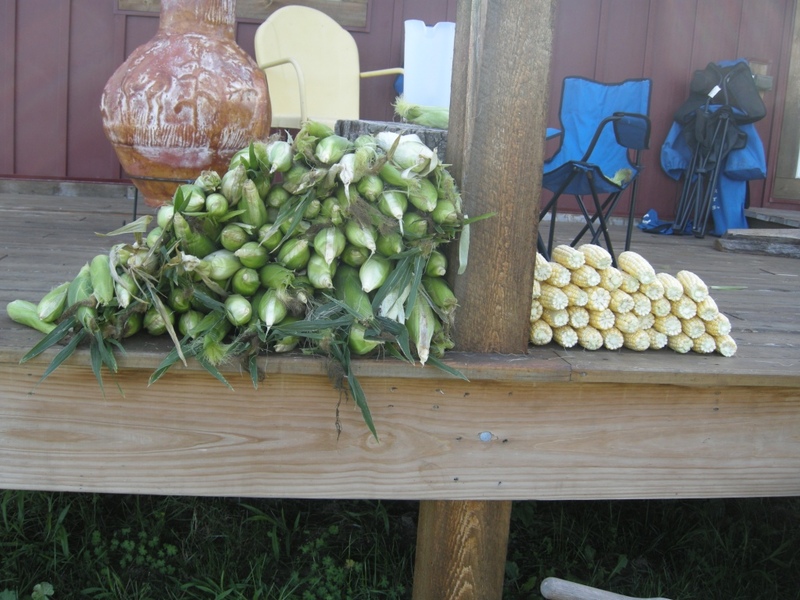 Then, about 10 ears of corn at a time. We’re blanching here- boiling for a short amount of time to stop the growing enzymes inside the vegetable. You boil for, um, 5 minutes? Big shoulder shrug here… I waited until the corn was bright yellow and then took it out. You’re supposed to plunge it in ice water then to completely halt the cooking progress, but I was unprepared and out of space. I boiled for less time and let it cook a little more while cooling down. Don’t tell your gramma. I’m a rebel. Ok, the corn boils for about 5 minutes and cools down. Cut the corn off the cob. 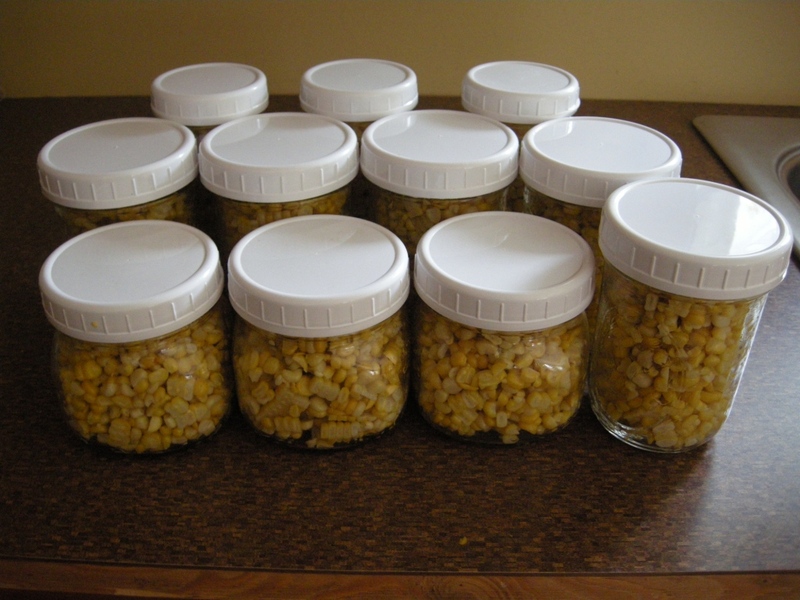 Put that corn in your jars. Put the lid on and shake like mad to help pack it down a bit, and then add a little more corn on top. Repeat everything until all your corn is gone or all your jars are full or you are about to die of heat stroke. Put all your jars in the freezer. Take all the leftovers out to the animals. For foods that will go straight in the freezer, I use the plastic screw-top lids. They’re awesome. I’m keeping track of the grocery items we’re replacing over in the the right column. 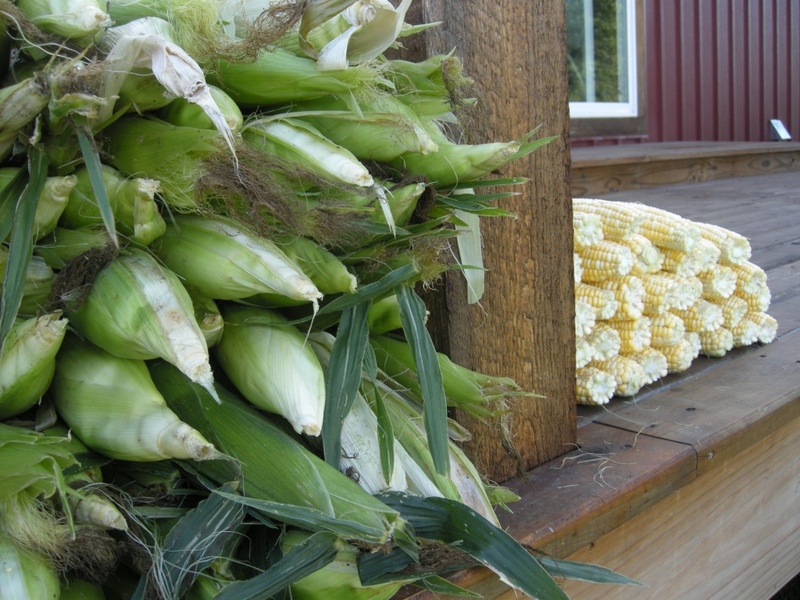 So far, we’ve got corn, strawberry jam, and pickles. Lots more to go! My life is a jumble of countless ridiculous minutes which add up to hours which add up to days which lead us to Friday, Saturday, and Sunday. Then I do it again. 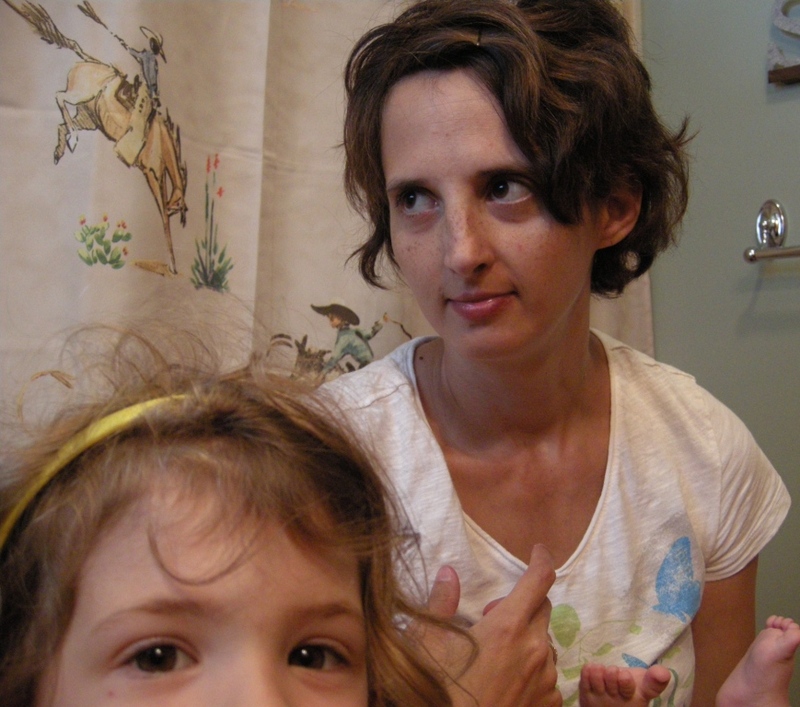 The 3 of us are in the potty again… we’re 100% on the #1 issue. Public bathrooms, no problem. Big potties, little potties, no problem. But going #2? It is a mere concept. Like planning ahead for dinner. Like knowing you CAN have good posture but chose every day NOT to have good posture. Like people who give up carbs. I cannot fathom. Come on in. We’re in the loo. When it’s 91° outside not accounting for the 100% humidity, I like to steam out our kitchen by throwing on a stockpot of boiling vinegar and salt. Pickles, anyone? You’ll have to wait until October 1st. 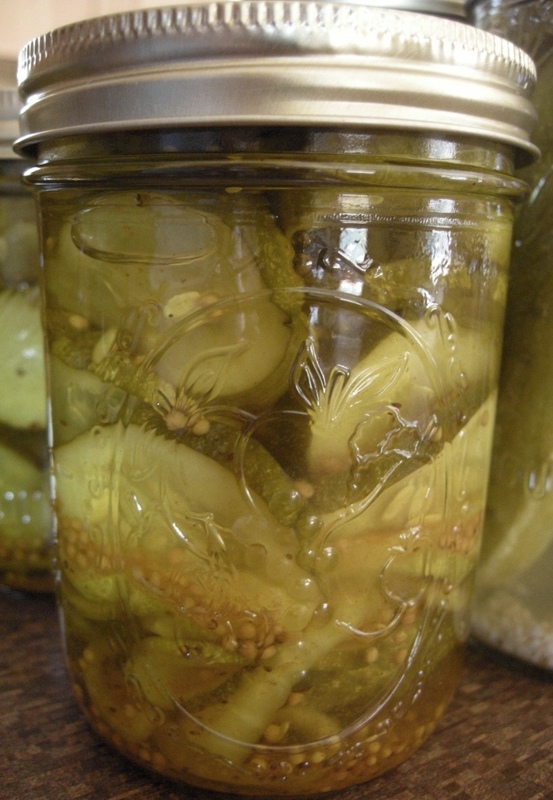 The hardest part about these babies is waiting the 2 months for them to soak up the brine and taste like, well, pickles. But, I’ll save you a jar. The Boy favors the bread and butter variety… which I did not know before we married or I would have scheduled an extra pre-marital counseling session. I’m all for dill. Heavy dill and garlic. *sigh* We are completely different people. I am trying to be a better farmer and consumer by canning or freezing a few more items I would normally buy at the big grocery store. Strawberry jam, frozen local blueberries, pickles… that’s where I stand so far. Soon I’ll add green beans, summer squash, and sweet corn to that list. That makes 6 items grown by me or my immediate neighbors and processed by me instead of a factory and workers far, far away. My goal for this year is to replace 10 items in my kitchen with home•grown / home•processed / home•made ingrdients. Can I count our eggs? I think so. So, 7. What else? Our meat! Vension and beef will be home•grown this year. I should not have to buy beef at the store in 2011. So, 8 items. It’s not as hard as it seems to get back to basic, simple food. Oh my word, I forgot tomatoes. Our wild garden will produce tomatoes soon. So, spaghetti sauce and a few cans of diced tomatoes can be replaced. If that counts as 2 grocery items, I’m already there without breaking a sweat. Let’s go for 15. What else could I replace?